A diverse group of individuals — including a womanizing pilot (Nigel Davenport), a domineering hunter (Stuart Whitman), a failed mining engineer (Stanley Baker), a beautiful divorcee (Susannah York), a soft-spoken doctor (Theodore Bikel), and a former Nazi officer (Harry Andrews) — struggle to survive in the Kalahari desert after their passenger plane crashes. 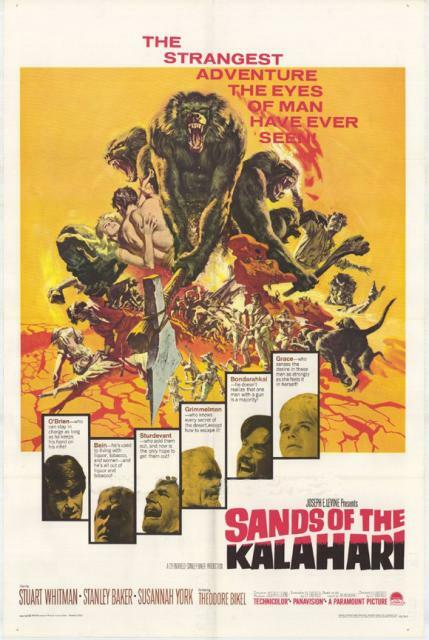 Released the same year as Robert Aldrich’s Flight of the Phoenix, writer-director Cy Endfield’s survival tale — based on a novel by William Mulvihill — starts with the same premise of a plane crashing in the Kalahari desert, but moves in an entirely different direction. While the survivors of the Phoenix focus on rebuilding a plane that will lift them out of the area, the motley passengers in Endfield’s film become involved in an existential fight for dominance. Indeed, it’s soon made clear that Endfield is primarily concerned with highlighting the passengers’ devolution into primitive beings (much like the tribes of fang-baring baboons occupying the area), as sexual passions flare — York, conveniently gorgeous, is the only female passenger — and Whitman’s increasingly obvious desire for mastery at any cost (he’s the only one in the group with a gun and ammunition) takes hold. While the plot and dialogue occasionally strain credulity, we’re nonetheless intrigued by the “Lord of the Flies” mentality which emerges, pitting passengers against each other. Fine on-location shooting and an unusual script makes this a worthy adventure flick for those who enjoy tales of survival under extreme circumstances. No, but it’s recommended. Listed as a Sleeper and a Personal Recommendation in the back of Peary’s book. At IMDb, a surprising number of ffs lament the fact that ‘SOTK’ is currently a somewhat-lost, more-than-somewhat-under-valued gem. I’m going to have to agree. This is not easy material to pull off but I’d say get ready for an intriguing cumulative effect. I’m certain I saw this when I was young but, boy, this one really is out of circulation and that’s a shame – I think it’s gripping stuff. Yes, it does strain credulity a bit, but not to the degree that you can’t buy into it. The hysterics are kept in careful check. I was with the progression all the way and the story doesn’t seem to suffer from padding of any sort; it’s constructed rather well. Of particular interest is the film’s climax. Why exactly does Whitman make that ultimate decision? And how exactly does it play out? The last image is a long shot that only adds ambiguity. Personally, I don’t interpret the conclusion as a win-win.